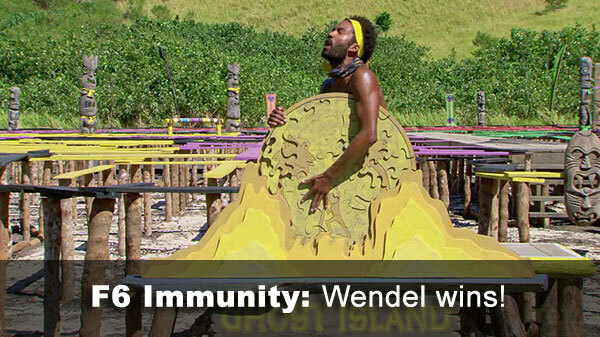 Ep.14: "It's Game Time, Kids"
Final 6 Immunity challenge: "Vin Skully" - Wendell dominates the puzzle, and this time calls Probst over right away. Final 6 voted out: Sebastian, 4-1-1 over Domenick and Donathan. 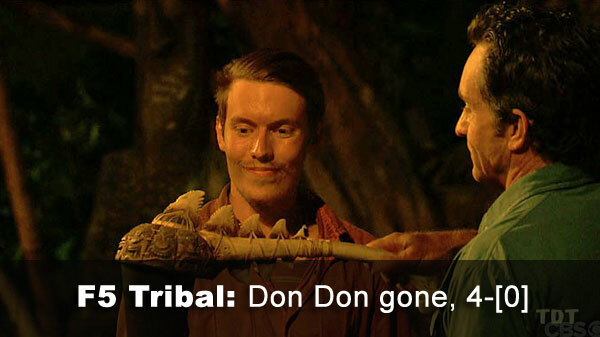 Dom pre-plays the David Wright fake idol; Seb declines to play his extra vote advantage, even though it expires at this Tribal. 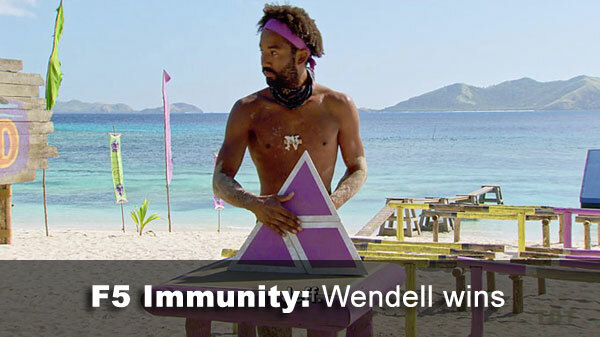 Final 5 Immunity challenge: "Pyramid Scheme" - Wendell again masters the puzzle, wins. Final 5 voted out: Donathan, 4- over Laurel. Wendell plays his idol for Laurel, voiding 1 vote. Dom plays his idol for himself, voiding zero votes. 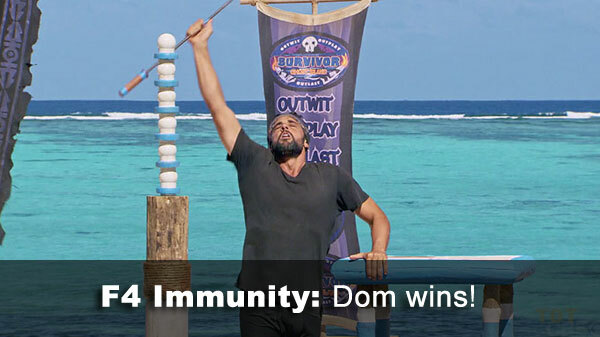 Final 4 Immunity challenge: "Stacked Up" - Wendell drops his stack, Dom wins. Final 4 Ghost Island: Everyone goes there to... choose an urn? WTF? 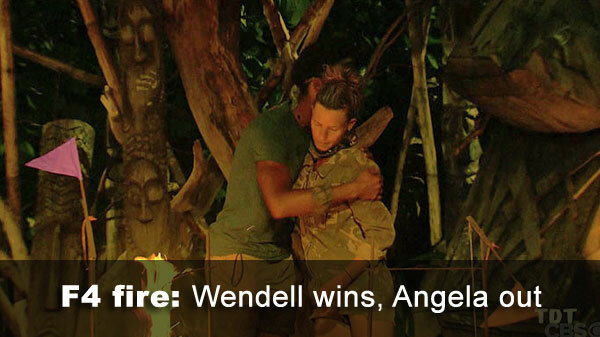 Final 4 out: Wendell beats Angela at firemaking; Angela out. Final jury vote: Wendell and Domenick tie, 5-5-0; Laurel becomes the final juror, and Wendell wins! - The final juror: Laurel was both a finalist and a juror. Technically, she saw only 10 jury votes as a finalist, but Dom and Wendell saw 11 total. So she should have 10 TotJ, while Dom and Wendell have 11. 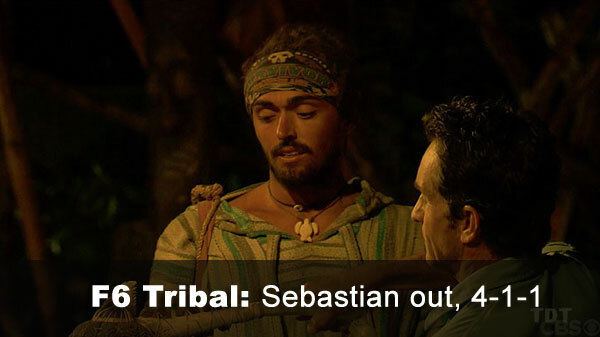 - Sebastian received 4 votes, from Angela, Domenick, Laurel, and Wendell (voted out, 4-1-1). - Domenick received 1 vote, from Donathan. - Donathan received 1 vote, from Sebastian (who did not use his extra vote advantage). - Donathan received 4 votes, from Angela, Domenick, Laurel, and Wendell (voted out, 4-). - Wendell received 5 votes, from Chelsea, Kellyn, Sebastian, Donathan, and Angela. - Domenick received 5 votes, from Chris, Libby, Desiree, Jenna, and Michael. 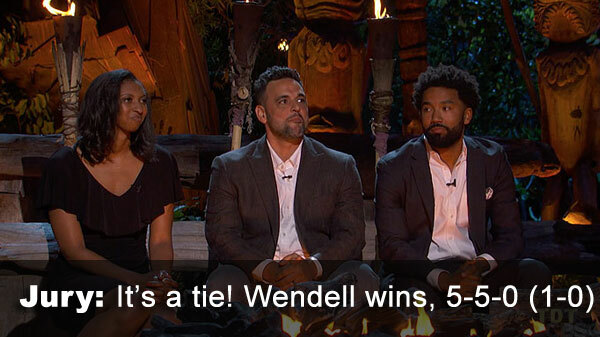 - Wendell received the final jury vote on the tie-breaker, from Laurel (winner, 5-5-0 [1-0]).